The time for Badassing is almost upon us, so we thought we’d post a few “event instructions”………..in the form of questions answered. Where should I park? There won’t be any parking on the industrial estate itself (it’s only little and it’ll be business as usual on the Saturday), but there are plenty of residential streets nearby where you can park. We don’t recommend parking on Green Lane West due to the number of lorries and vans that use the road over the course of the day. There are some residential roads nearby: Dorchester Road, Windsor Road, Hawthorne Avenue, Leicester Avenue, Sussex Drive. Do I need to sign on? Yes. You can sign on from 06:00 to 07:00. This is principally so we can give you your rider number and record your presence. We envisage a staged start. “Racers” (trying for 12 hours or less elapsed time and wanting others to work with) will leave at 06:40 and “Survivors” (12 -15 hours elapsed time and in need of some like-minded company) will leave at 06:45. We are flexible around this though. You can leave earlier or later if you wish. The main thing is we need to know exactly when you start so we can record it. If you haven’t left by 07:15 you’re either late, very fast, carrying lights, or a bit of a loon. Is there a safety briefing? Yes, at 06:30. Other than this we’ve placed important safety information on the ride instructions. Even if you do not use them please give them a read through and take note of difficult bits, e.g. the naughty left hander on the descent of Jeffrey Hill. Are there toilet facilities? There is one toilet at the unit. Please bear this in mind when planning your pre-ride dump. By the way, if there is a queue ladies get a pass straight to the front of it. Ladies please remember to leave the seat up once you’ve finished. Are there shower facilities? No, and no complimentary massage either. Bring your own rollers for your warm up/down (Bradley doesn’t share). Is there food at the start? No. Your breakfast is your affair. Where will the feed stops be during the event? The first feed stop will a van parked up at approximately 62 miles with the following legend written on the side “Lakes Garage Doors”. The second feed stop will be a similar van in Downham village at approximately 106 miles. Last year we managed to get a van to the top of Longridge Fell at 142 miles, but do not rely on this. The key to getting round the Badass in one piece is a well-paced ride built on a good nutrition/hydration strategy. We suggest you think carefully about energy gels/bars, and how much energy drink powder you need to bring with you to supplement whatever food you might eat at the feed stops. Remember there are shops/cafes on the way if you’re taking a more leisurely approach. Do I need to stop at the feed stops? Yes. Well, you paid for the food and you might need to re-fill your bottles so it would be a good idea. Also, we want to record time splits and make sure we know where everyone is. So please stop and give your name/number and we’ll match it up with your name/number on our sheet and assign you a time. We might also want to check your cycle computer to verify your mileage (we’re presuming everyone will have a cycle computer of some sort). If you’ve arranged your own support we’d still like you to stop and shout your name at us. What about the signs? We will sign the route on the Friday (it took us 14 bloody hours last year), but, as with all sportives, there is the chance that some signs might be removed or even repositioned. Last year a dickhead farmer knocked down a sign at the left turn into Rigg Lane at the bottom of Littledale descent which caused some to overshoot. Luckily one of our local lads who knew the way stopped and re-erected the sign for those following. We also think we had a sign removed/torn down in Tosside. What about ride instructions? We’ll send a set of ride instructions to all of you, as well as the GPX file for Garminers (if you haven’t already got one). You can print out the ride instructions and laminate them/stuff them in your back pocket as you see fit. We recommend you bring a map or a print out of a map if you don’t know the area. Most, though not all, of the route can be found on Ordnance Survey Explorer Map OL41. What about road conditions? The Prof trundled round the route yesterday to check everything is still there. He reports that a number of roads have been re-surfaced and road works have been popping up seemingly at random all over the place. 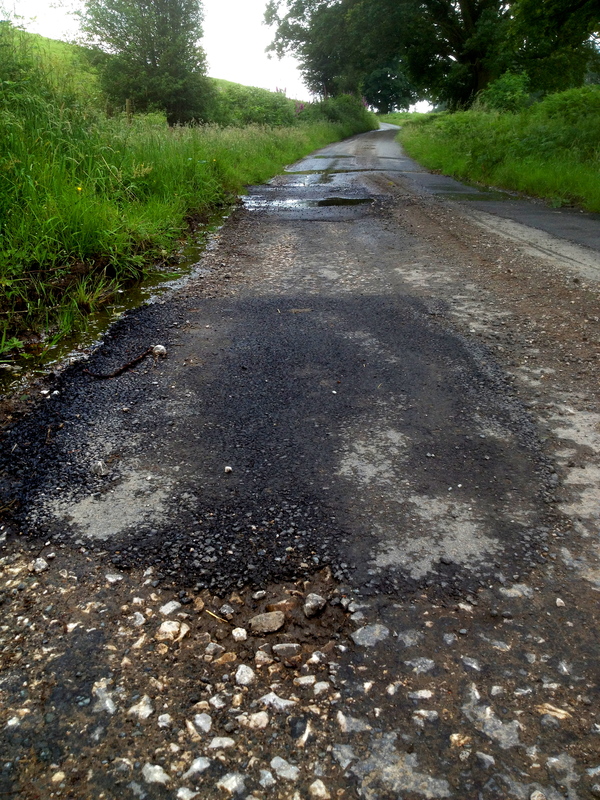 However, the roads can best be described as gnarly in places and it appears that a giant tarmac gobbling mole has been biting holes out of the road surfaces all over the Bowland Badlands. The descent off Marl Hill down to Easington crossroads is especially bad this year as you go down through the trees. Under no circumstances should you attempt to kill yourself here. We strongly suggest you go for the extra weight of puncture proof tyres (the last thing you want to be doing on a 167 mile ride is fixing multiple punctures). If you go for racier tyres make sure they are new and have plenty of rubber on them. Do I need insurance? YES (British Cycling or CTC). Our insurance is for us if you or we do something stupid, not for you. What happens at the finish? When/If you get back, we’ll record your time, shake your hand, and say well done. Then you go home or to the pub, depending on your preference. We might allow you to mill about aimlessly for a while or lie down on the floor if we’re feeling kind. What if I crash or have a heart attack? Dial 999/112. What if I have a mechanical? There’ll be a track pump and a few tools at each feed stop. Other than that you’re on your own. We’ll get in a few inner tubes that we can sell on to you at cost at the feed stops, so bring some money (No, we won’t give you change for a £20! You’ll just have to put up with carrying a few of those heavy pound coins). What if I’m late to the start? Call us on our Bowland Badass Headquarters Hotline at 01524220030. What if find I’m going to take longer than 15 hours to get round? We hope you’ll have considered that possibility in advance and equipped yourself with lights. If you’re going to be late because of a mechanical or because you’re exhausted but still desperately want to finish and get a time, just give us a ring keep us in the loop. We might wait for you. What if I decide to sack it? Please give us a ring. We’re sure you can look after yourself but it would be nice to know you’re not lying senseless in a ditch somewhere. Better still pop back to Bowland Badass Headquarters for us to officially record your mileage and tease you. What if I get lost? The Prof will be standing by at BBH to field calls from lost souls. He’ll be able to set you on the right track. Having said this last year he fielded calls from only 2 people, but both of them kept getting lost! What if I find I need a garage door? 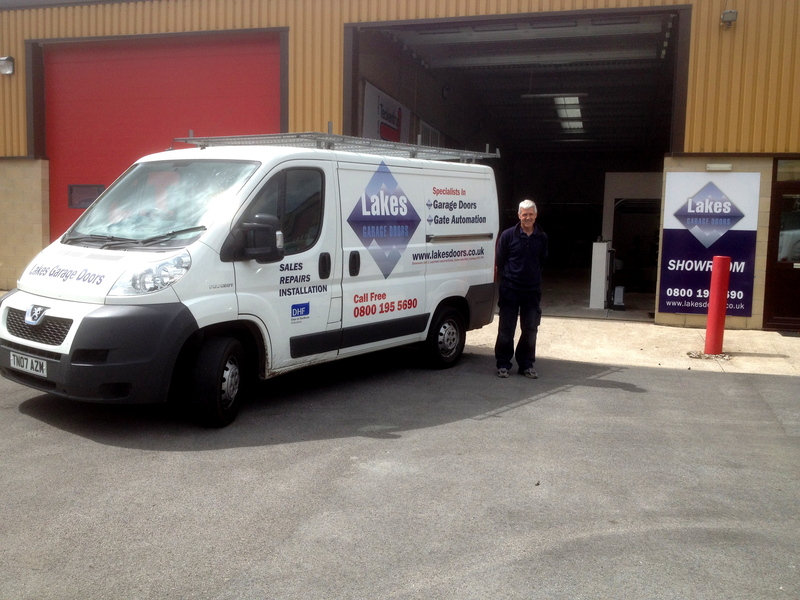 Our proud sponsors – “Lakes Garage Doors” – will be pleased to supply one. I’m not yet scared enough about this ride, despite the fact that it is exceedingly long and hard. What should I do? Read through our Bowland Badass Climbs section again. See you on Saturday 6 July bright and early!!! Posted on June 27, 2013, in Uncategorized. Bookmark the permalink. 3 Comments. Why on earth have I entered this??? Smallest ring I’ve got is a 39. Should be a laugh.